The Behringer Model D Analogue Synthesizer is a compact and portable reproduction of the legendary 1970s Minimoog Model D monophonic analogue synthesizer. It stays true to the original with features such as its triple VCOs, Ladder Filters and LFO for a truly authentic analogue sound. 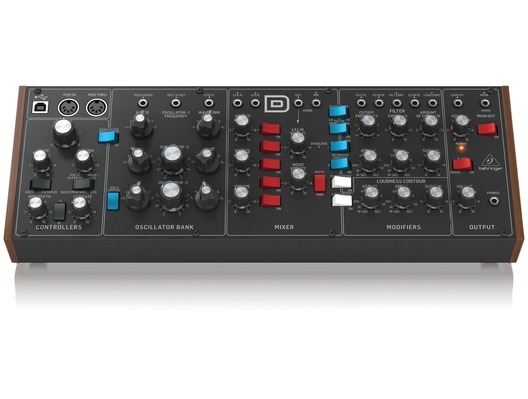 The Model D has been designed to be smaller and more portable than its predecessor, which has been achieved by removing the keyboard feature but can easily be connected to MIDI controllers via its USB and MIDI ports. The Behringer Model D Synth, with its convenient Eurorack size, is suitable for both use in the studio and on the road. Great care has been taken in designing the MODEL D including the true to the original D Type circuitry with its matched transistors and JFETs, ultra-high precision 0.1% thin film resistors and polyphenylene sulphide capacitors. This highly-focused attention to detail is what gives the MODEL D its ultra-flexible sound shaping capability, which covers everything from super-fat bass and lead tones, stunning effects, progressive organ sounds and all the way out to the otherworldly sounds of your imagination. The inspired synthesizer tracks laid down in the 1970s and '80s are etched in the annals of progressive rock, wave and synth-pop music forever, making them truly classic in every sense of the word. MODEL Ds pure analogue signal path with legendary VCO, VCF and VCA circuits, lets you recreate all of that magic or design incredibly fat and original sounds that will make you a legend in your own right! MODEL Ds 3 highly-flexible Voltage Controlled Oscillators (VCOs) provide an incredible range of 5 waveforms for sculpting the perfect sound. Oscillators 1 and 2 options include: triangular; triangular/saw; saw; square; wide pulse; and narrow pulse, while OSC 3 features: triangular; reverse saw; saw; square; wide pulse; and narrow pulse. Additionally, all 3 VCOs can be adjusted across an extremely-wide, 6-octave range (LO, 32', 16', 8', 4', and 2'). This amazing flexibility gives you all the tools you need to be your creative best. 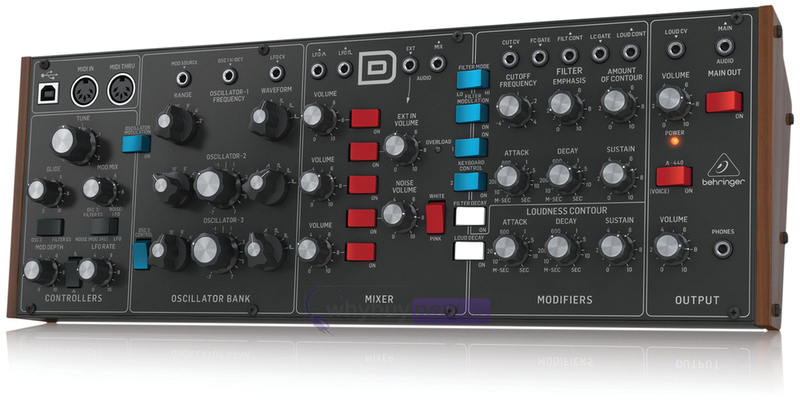 The very heart of MODEL Ds sound is its highly-flexible 24 dB Ladder Filter, which lets you freely experiment with the Cutoff Frequency, Emphasis, and Contour to dial in the perfect sound. MODEL Ds Filter Mode switch can be set to either Lo- or Hi-pass for selecting the range of your choice. You can also adjust the Attack, Decay, and Sustain controls to affect the cut-off frequency with time. The VCA Decay switch lets you set the length of time the note lingers after the key has been released. Additionally, support for filter-keytracking allows you to select how much filtering is applied based on the note being played. And if you want to add modulation, just set the Filter Modulation switch to the On position and use the Controllers Mod Mix knob to make it so. The VCA can even be overloaded via MODEL Ds feedback circuit to add insane spice and edge to your sounds without saying "goodbye" to your precious low-end content. You are always in complete control of MODEL Ds onboard modulators, which features: adjustable Tune; Mod Depth; LFO Rate; Glide (portamento); and Mod Mix knobs. A range of switches is provided for selecting between: triangle or square wave oscillation; modulation On or Off; OSC 3 or Filter EG (Filter Envelope); and Noise (Mod SRC) or LFO. The Tune knob is used to adjust the frequency of OSC 1, 2 and 3 (as long as the OSC 3 switch is turned off). The internal Noise generator, which is switchable between either Pink or White noise for dramatically expanded waveform generation, is the default modulation source, unless an external Mod Source is connected at the 3.5 mm input jack. The BEHRINGER MODEL D is the ultimate mono, all-analogue synthesizer in its class especially when it comes to sound quality, versatility and affordability. While it is a monophonic instrument (one note at a time), MODEL Ds 16-note Poly Chain function lets you combine multiple synthesizers for up to 16-voice polyphony plus provides vastly improved reliability and stability over its 1970s and '80s predecessors. Designed around an intuitively-linear workflow, MODEL D benefits greatly from its semi-modular design, which requires no patching for immediate performance. Just connect your favourite keyboard or computer via MIDI over DIN or USB and start exploring the world of analogue music synthesis right out-of-the-box. MODEL D has 29 knobs and 19 switches, all laid out in a highly-intuitive format that puts the joy back into your music creation. Input and output connections include: MIDI I/O and Thru over USB/MIDI DIN; modulation and audio inputs; OSC1 frequency control; external control of filter cut-off, resonance and contour; Main Out and Phones, with its own dedicated Volume control. 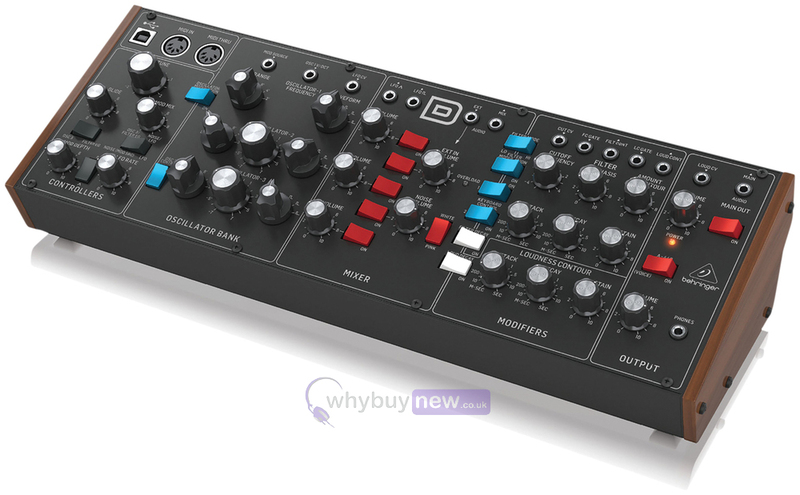 Here we have the Behringer Model D Analogue Synthesizer in new and B-stock. The B-stock version will come boxed 'as new' with a 1-year warranty. Buy this amazing Behringer Model D Analogue Synthesizer with confidence with 100% satisfaction guaranteed or your money back!